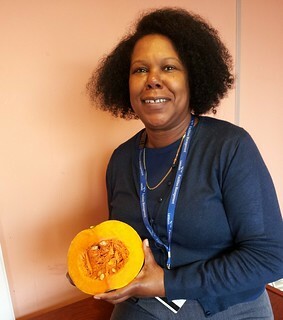 Caroline, Lambeth resident and council officer, has kindly written down the recipe below using butternut squash, a family favourite. With a fair amount of sunshine in a good year (not 2012!) 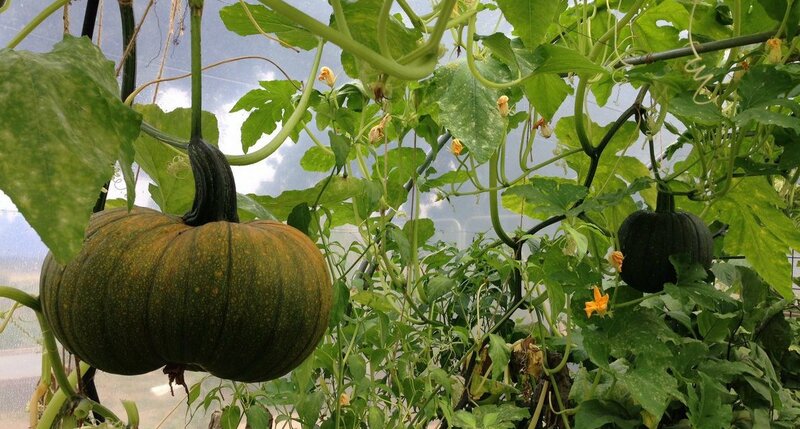 we can just about ripen butternut in the London growing season. As other winter squash, if they are unblemished they will store through to the next spring in a cool, dry, dark and ventilated corner. Butternut squash currently (March) in the supermarkets are from the southern hemisphere, Argentina and South America, but we could so easily produce more of our own. If you’re a I think vegetarian this curry would be really tasty without the chicken. We just need a good bean recipe to make up the protein difference. I will soon write a link about full protein diet from beans and other legume seed (ie lentils and peas). Caroline agreed to be photographed with this piece of lovely orange squash. 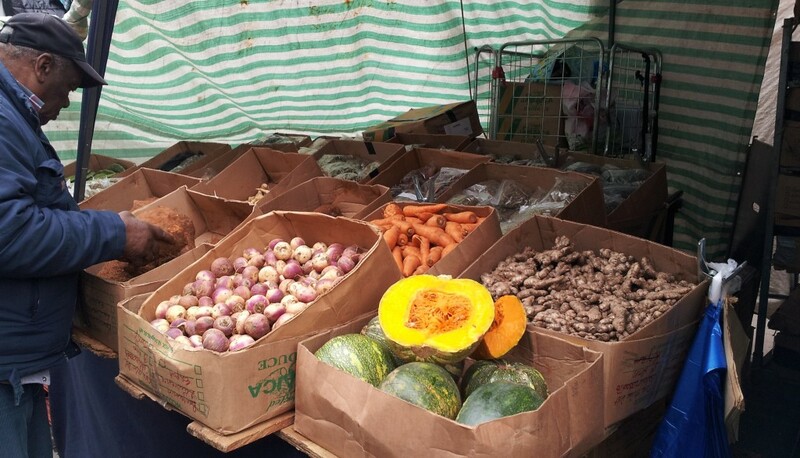 We’re putting together a cookery book that’ll show the diversity of recipes in Lambeth, and get us all cooking, ideally using the crops we’ll grow in 2013! Thanks, Caroline. Squash and bean recipes of all sorts from all over the world are warmly welcomed! Click here to see the recipes page. Juice the lemon and dilute in a bowl of water. Remove the skin from the chicken and discard. Wash chicken pieces in the lemon solution and set aside. Remove chicken pieces from the marinade, retain onions and seasoning in the bowl. Heat oil and add chicken and seal on all sides, do not allow the curry powder to catch in the pan. Add onions to the chicken and allow to soften together for a few minutes. Add water with the rest of the marinade to the pan. If you like it hot, add the chilli now. Cover and simmer for 10 minutes, then add the squash simmer until the chicken is cooked through. One minute before serving add the spinach, check seasoning. Tip: marinate the chicken in a glass bowl, so the bowl is not stained with the curry.